When in our process of significantly downsizing to our tiny house we had many moments of questioning which items we would keep, sell, or donate. We knew we would have to make sacrifices and had many items we enjoyed but just wouldn’t have space to store. 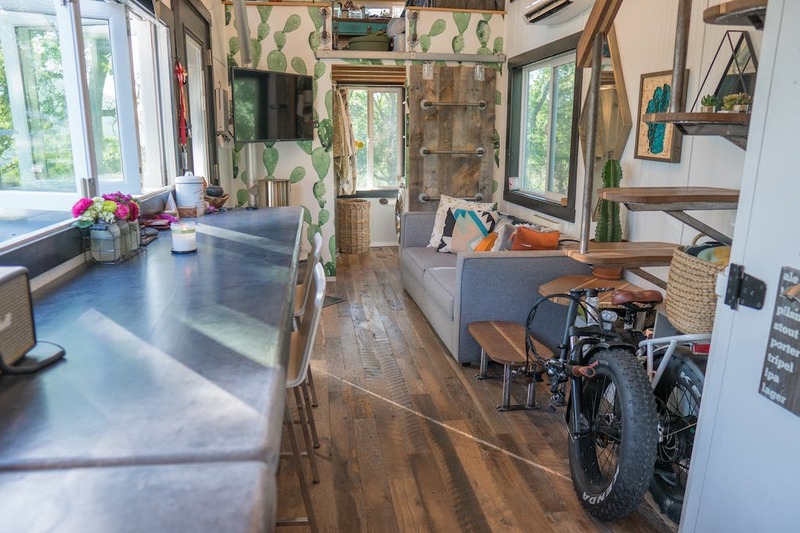 When it came to items of recreation, we sold most to save on space as well as fund our tiny house build. At the time of building, we didn’t yet have a location of where we would be living with our new home, which influenced us even more so to downsize on items. Once we figured out our living location and what small outside storage we would be able to have, we could then repurchase the recreation items that we really loved. We’ve both always owned bikes and enjoy riding them for leisure. But, since we weren’t avid bike riders, it was a sacrifice we knew we could make work temporarily. We both had nice quality bikes and could sell them for much-needed funds for our build since every penny counts when building. After several years of being in our tiny house and riding our friends’ bikes here and there, we knew we wanted to look into buying bikes again. Our previous bikes were very nice road bikes for which we planned to fully get into being diehard fitness bikers…. That didn’t happen and biking wasn’t what we ended up enjoying for fitness, we preferred to stick to our gym routines for that. So our hunt for a nice quality bike for fun and for covering lots of ground and sightseeing started while traveling. We looked into several options before reaching a conclusion. Space and storage would still be an issue which is why we held off on buying bikes again for a while. We even looked into and tested out a couple of foldable scooters. Those seemed like a fun option, but after testing them out several times and seeing how heavy a scooter is to carry and fold up and how quickly the battery dies, not evening mentioning the lack of exercise we would get, we realized quickly that an expensive foldable electric scooter wasn’t the best option for us. Plus, we could never shake the dorky feeling we felt when riding them. We then debated about electric bikes versus conventional bikes. The challenge with electric bikes, or so we thought, seemed to be the very expensive price point for not one but two bikes, then also still being large to store. We travel and do road trips often so the ability to take them with us is a must. But even to store them at home would still be cumbersome. After much hunting we happily came across Rad Power Bikes, which offered the best of both worlds. Rad Power Bikes has many models but the one that stood out to us and fit our needs was the RadMini. 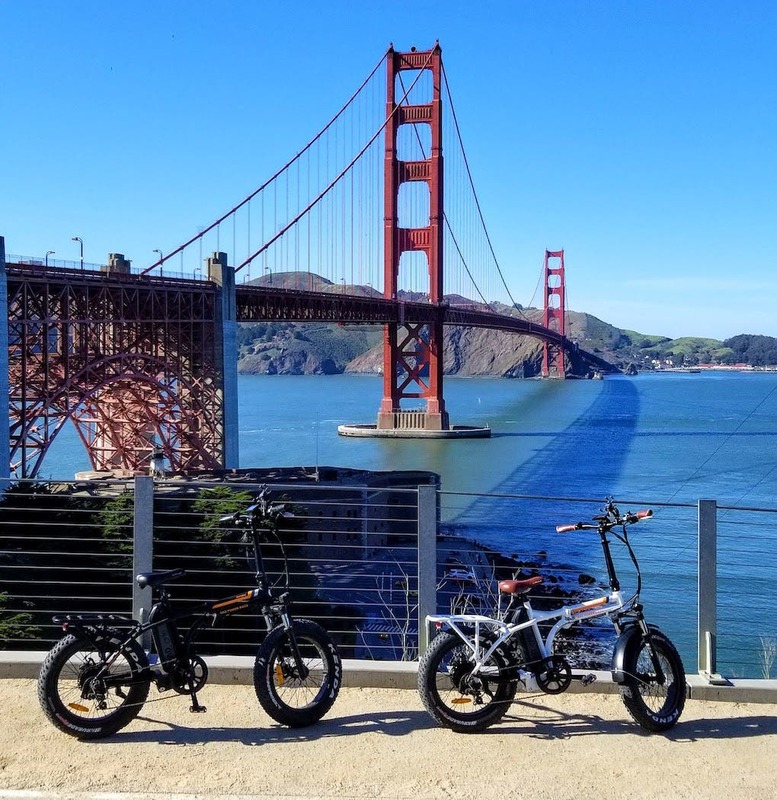 The RadMini is a foldable electric bike with 4-inch fat tires that made it capable to go on sand, dirt, and snow, all while still being a comfortable road bike. 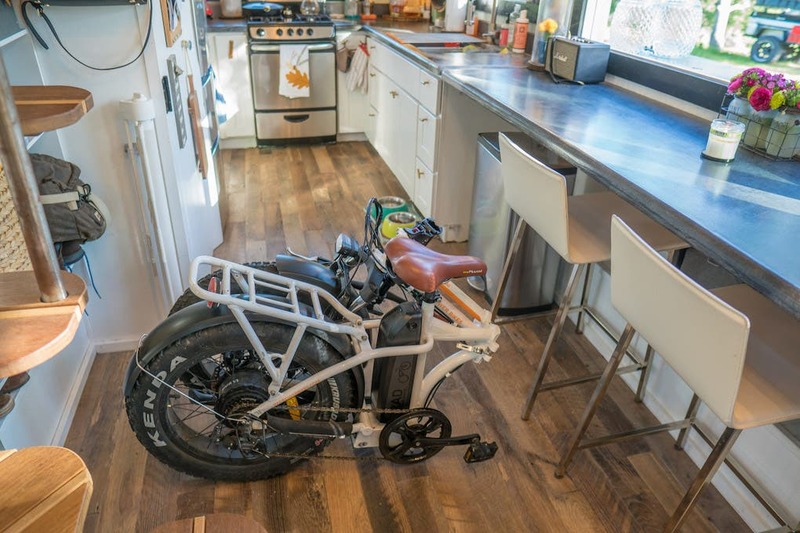 Being foldable is a HUGE plus when you live in a small space, the large Lithium-ion battery is packed with Samsung cells and supplies a 750W 48V power system to keep us riding for up to 45 miles on a single charge. 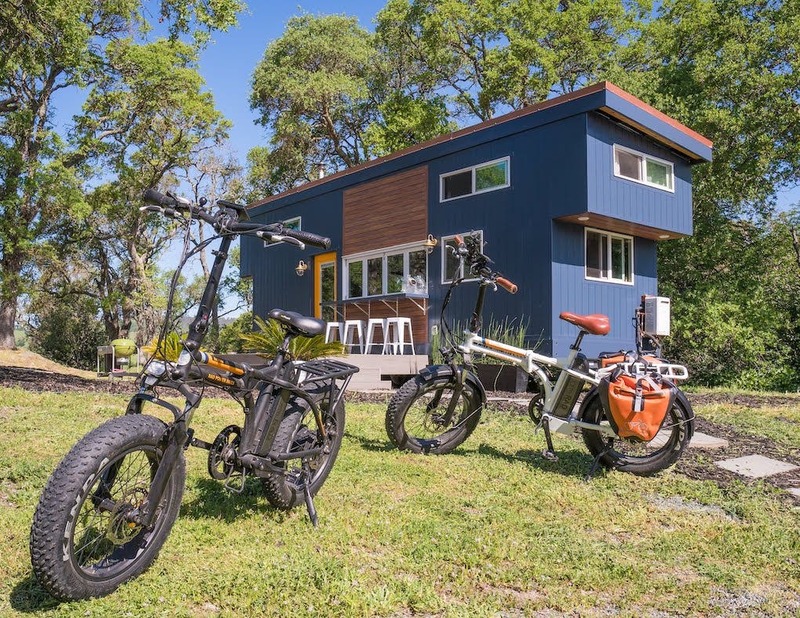 It is a perfect electric bike companion for tiny house dwellers like us. Full size fun with a tiny package when folded in half. 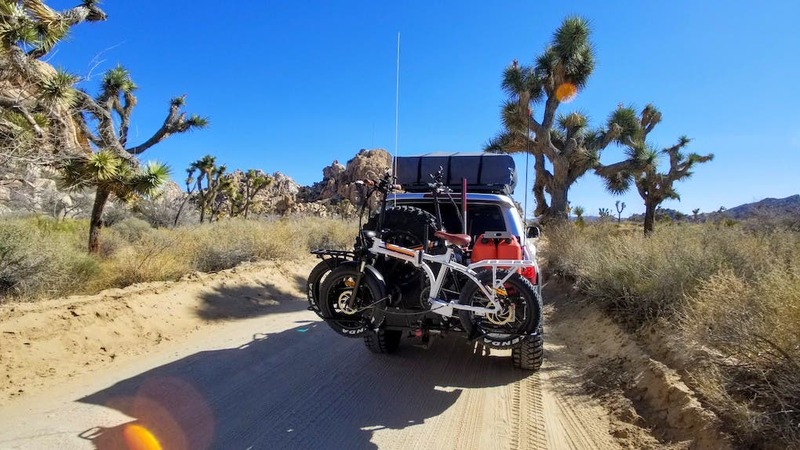 Setup takes about 30 seconds, if that, and the compact size allows us to pack up the bikes in any one of our vehicles. 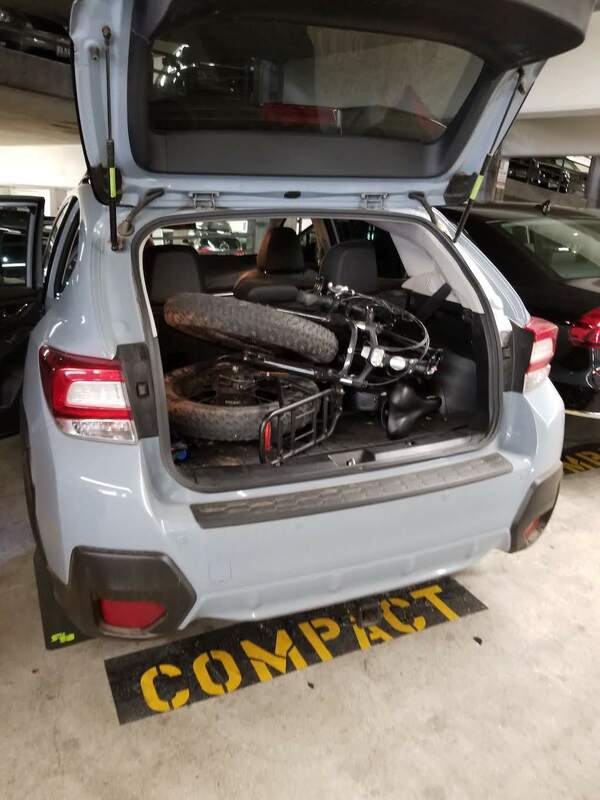 We even fit both our bikes in the back of our compact Crosstrek with plenty of room for backpacks and other gear. The pedal-assist technology and on-demand throttle allows you to choose how much power you want or need, depending on how much or little of a workout you feel like putting yourself through. This has really made riding bikes enjoyable as most of the time we like to take them out on a leisure afternoon and don’t feel like getting all sweaty everytime we ride! On a recent evening ride, we rode about 10 miles to grab dinner a couple of towns away from our tiny house. On the way back, we wanted to make the trip go by faster, so with a twist of the wrist we were easily pushing 20 mph all the way home! At 63 lbs, these bikes are not lightweight, but what it has in heft it makes up for ten fold in power. On the handlebars, there is a full LCD display which includes a speedometer, wattmeter, and odometer so you can keep tabs on how much reserves you have to get you back home. 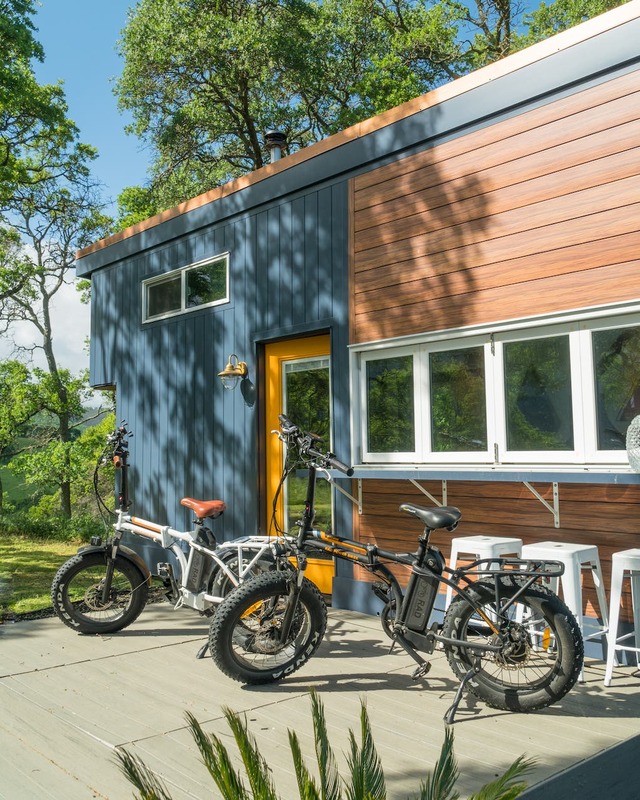 If you run out of power, this ebike just turns into a regular bicycle! It also has a integrated headlight that is powered by the main battery so you have lots of illumination on evening rides. In addition to the battery pack for electric power, you also have a 7-speed Shimano Tourney drivetrain to tackle all types of terrains. Our tiny house is parked up in the hills, so testing out the low gears for the steep hill climbs around our home was one of the first things we did when we unpacked the bikes. It works great! Since owning our bikes, we have taken them with us everywhere as we’ve traveled. 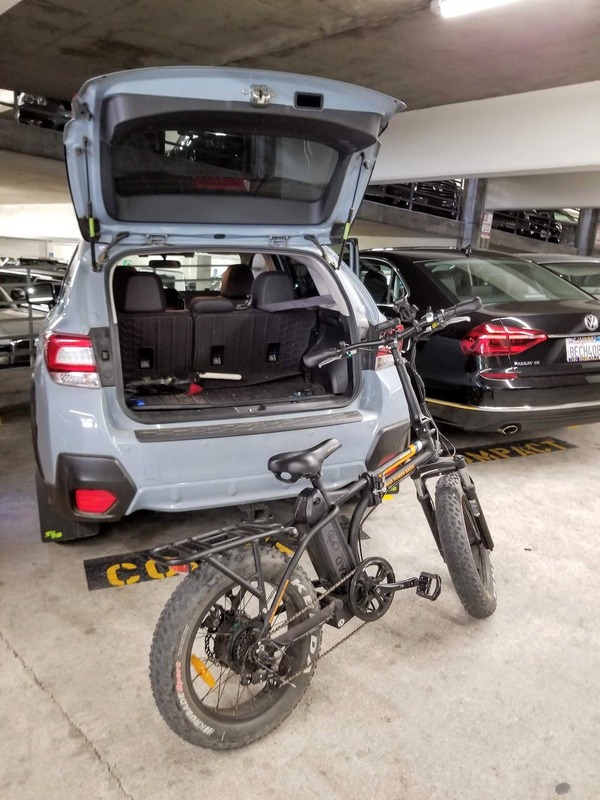 Being able to put them on a bike rack or fold them up and stick them in the back of our vehicles, out of the elements, and out of sight of potential thefts is a huge advantage over any bike. We have really been surprised as to how easy they are to stow away. When they are out and we are riding around they sure do grab a lot of attention. We have even met so many other fellow Rad riders as well on the trails around our local cities. We were drawn to these bikes right off the bat as they are just so unique and cool looking and that is even before you realize they fold in half! 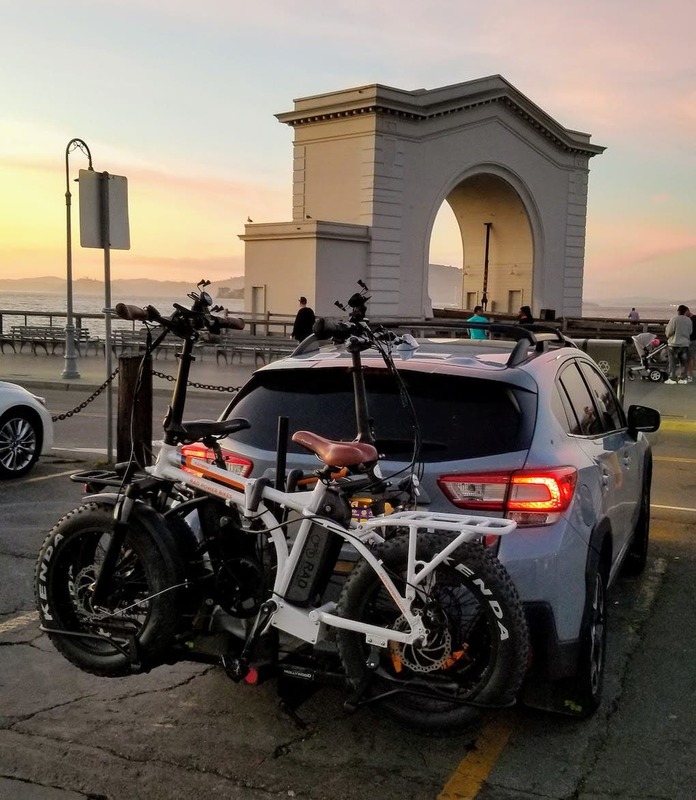 With several hundred miles logged so far on our ebikes, we are still in love with them and without a doubt we have made the right decision in going with Rad Power Bikes. 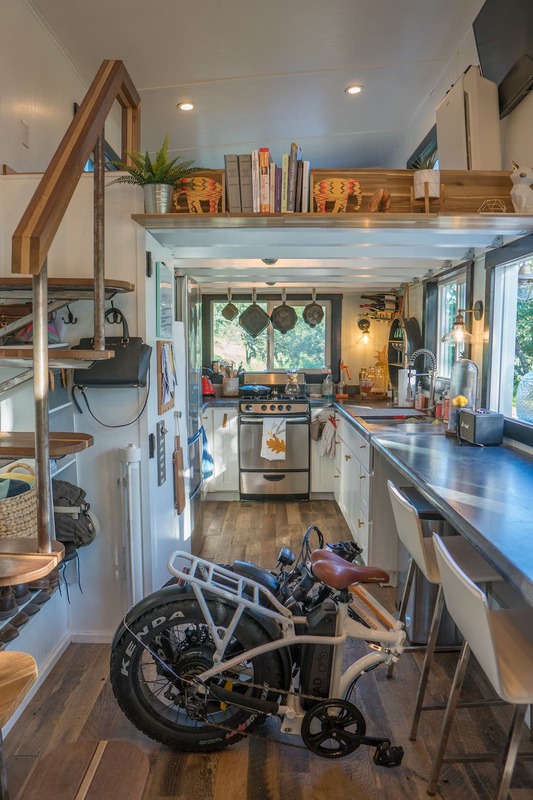 They truly are the perfect tiny house companion with so much packed into such a small footprint! The Bafang geared hub motor gives you 80Nm of torque to get you to a top speed of 20 mph. New and improved 48V 14Ah (672Wh) batteries give you an estimated 25-45 miles per charge. You get a full day’s worth of use without having to stop to plug in while maintaining a sleek profile and great weight balance front to back. Get 750W of power on-demand with the twist grip throttle. The included on/off button helps prevent accidental activation and allows you to only use the throttle when you want to. The custom RadMini suspension fork has 60mm of travel, preload adjustment, and lockout. Combined with the fat tires, you’re in for one smooth ride. 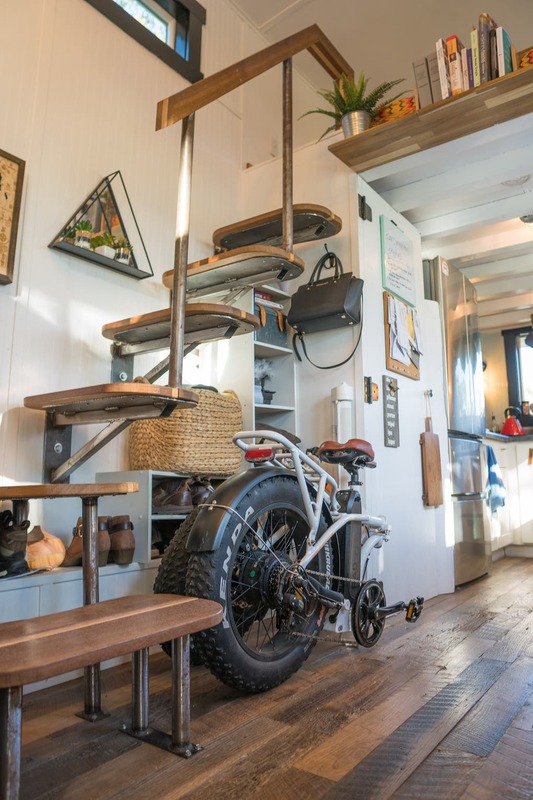 The RadMini can quickly and easily be folded to make transporting and storing the bike a breeze. 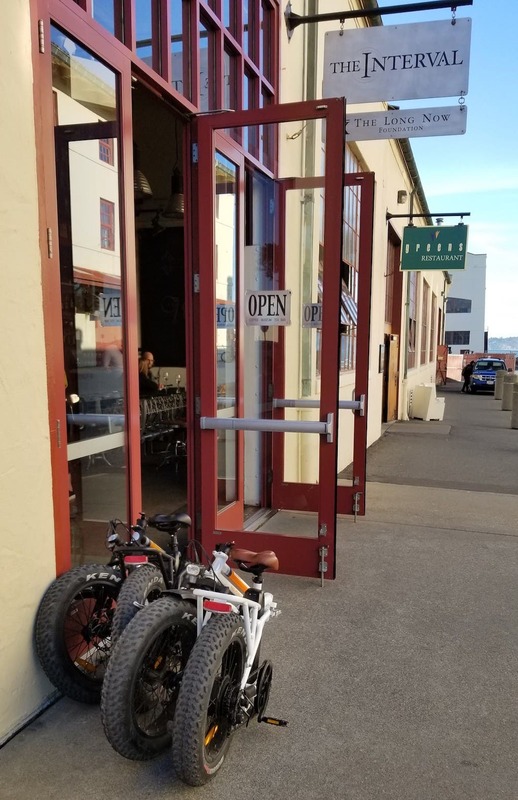 With two folding points (one on the handlebar stem and one in the middle of the frame), you can turn your rugged, all-terrain powerhouse into a discrete, convenient mode of transportation. Folded Length 44″, Folded Width 24″, Folded Height 29″. 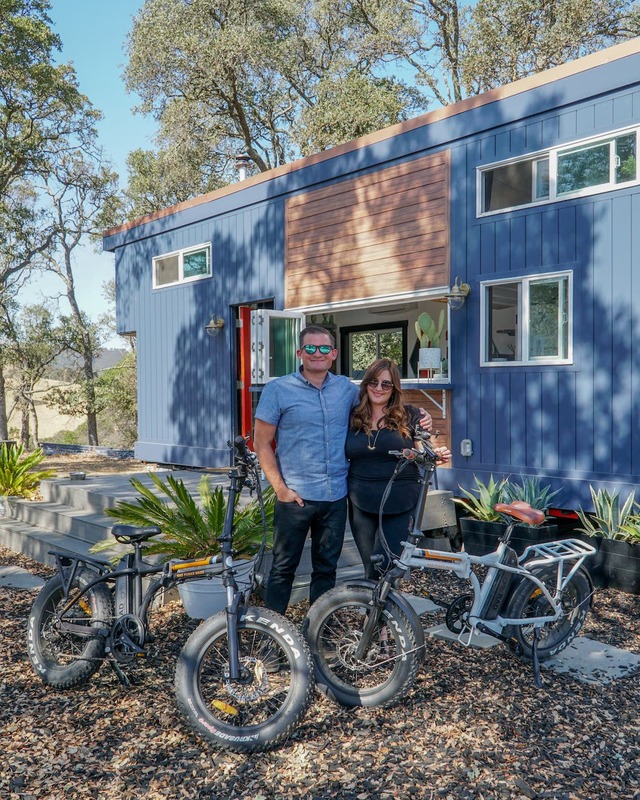 Hi – Just curious where this couple found a place to put their Tiny House.